After the success of our RISE package, we at Cycling ’74 developed a new set of Max UI objects that work with the centerpiece of ROLI BLOCKS -- a modular system of controllers -- called the Lightpad Block. It's a pressure-sensitive multitouch surface over an array of LEDs, and works directly in Max for Live devices, too. Download and install the package easily from the Package Manager (Max 7 > File > Show Package Manager). If you don't own Max, this is your opportunity to try it out for 3 months. ROLI will give you a Max activation code after you purchase BLOCKS. Max and Max for Live programmers can now easily use BLOCKS objects to create custom controllers for their own work. 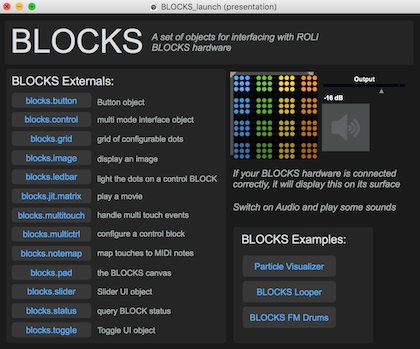 Check out our introduction to the BLOCKS objects in Max. In this video, we show you how to get started building your own interfaces for the BLOCKS hardware.